Customize a gift certificate template online with our free gift certificate maker in under 2 minutes! Print or save on your computer. No need to download any software or register. Select a gift certificate template from our huge selection. Use our free online gift certificate maker to customize the template. Download the customized gift certificate and print at home. Select a specific gift certificate template and customize it. Select a template from 101 different options and customize. Upload your own background image to create a unique custom gift certificate. Why use our gift certificate templates? Homemade gift certificates don’t need to look homemade! 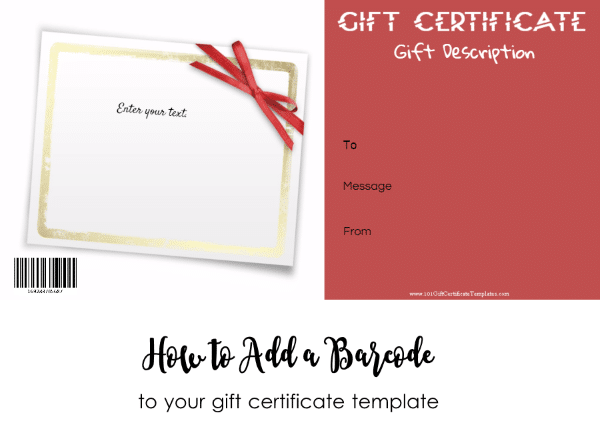 How to customize the gift certificate templates? Click on “customize” and our free gift certificate maker will open. The process is pretty self-explanatory. Chances are you won’t need an explanation. If you still have a question then read the general instructions below or the more detailed FAQ. How to customize the text? Select the gift certificate template that you want to use. They are all free! Double click on the text that you would like to customize. Type the text that you want to appear. Repeat the last two steps until you have customized all of the text. If you would like to add any additional text then click “add text”. You can then drag the text to wherever you want it to appear. You can also move the text around if you so desire. Click on “print” or download the file to your computer. It can be downloaded as an image or a PDF file. If you don’t have a PDF viewer then you can get one here. You can use the text as is but you can also change the style, size and color. In order to make changes, click on the text that you would like to change. Use the self-explanatory icons to make the necessary changes. If the gift certificates are going to be used by a company then you might want to add your company logo. Click on the “image” tab and upload the company logo. Drag it around until you place it wherever you want it to appear. If you need to make the image smaller then click on the bottom right corner and drag it to the left. You can enlarge the image by clicking on the bottom right corner and dragging it to the right. 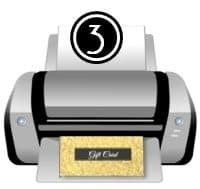 How do you print a blank gift certificate template? If you want to print a blank gift certificate template or a blank voucher template then click on “customize” to open the gift certificate maker. Erase all of the text by clicking on the little X on the bottom right corner of each text box. Once you have erased all of the text you can either print or download the blank certificate template. How do you cut out the gift certificate? Most of the gift certificates are rectangular and can be cut with scissors or a guillotine paper cutter machine. Some of the gift certificates have different shapes such as a gift shape. These are slightly more complex to cut but still pretty easy. The easiest way to cut them would be with scissors unless you have a paper cutting machine. What is the difference between a gift card, a gift certificate and a gift voucher? A gift card issued by a retailer is a prepaid card that can be redeemable for purchases at that specific retailer. When issued by a credit card company (such as Visa or MasterCard), it can often be redeemed at various retailers or even cashed out. A gift certificate is a term used in North America whereas the term gift voucher is used in the UK. 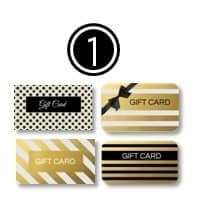 If you are looking for a gift voucher template or a gift card template you can still use any of the templates on this site. Click on “customize” to open our free gift card creator and change the text to “gift voucher” or “gift card” or whatever term you prefer to use. Why Use Gift Certificates or Gift Cards? For consumers, a gift certificate is a perfect solution for someone who has everything or if you are not sure what to buy. For businesses, gift certificates are a great way to increase your sales, especially during the holiday season. An additional benefit is that the gift cards are prepaid which is perfect for your cash flow. You can add your company logo to any of the gift certificate templates on this site. In addition to creating a more professional look, this will help to increase brand awareness. Should you use printed gift certificates or electronic gift cards? For smaller businesses, a printed gift certificate is often easier. Electronic gift cards require a special system to read, track and process the gift cards. On the other hand, a larger business will probably not be able to track printed gift certificates and might need an electronic system. Our free gift certificate maker enables you to create custom gift certificates personalized for the customer. The customer can also add a personal message to the gift certificate if you print it after purchased and not sell preprinted gift cards. Create a barcode with a barcode generator and save it on your PC. Click on the “Add image” icon (the last icon to the left). Select the barcode that you created in the first step. Move it to the correct location and enlarge it or make it smaller if necessary. 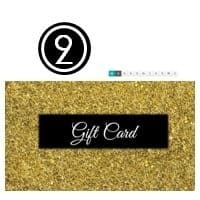 If there is a specific gift certificate design that you would like but don’t see here then please leave a comment and we will try to make it for you. error: Alert: Please open the gift certificate maker to create your own gift certificate!